Glad you're enjoying the ship, man! Those stats are nothing to scoff at. Especially the win rate. I have to ask though, why didn't you switch to AP on that Cleveland? I imagine he was close enough to you, would have melted him. I still run full AA build on mine mostly, but I very much like the idea of a 'selfish' gunboat build for it. I've played my Gearing Captain with SE and DE on the Kidd a couple times and those extra HP really make a difference. And it's semantics, but the Kidd does have higher mid-range AA values than Fletcher, and significantly more in every aura than the C-Hull Benson. Just have to remember, you didn't give up a set of tubes for AA, you gave it up for a Heal and Fletcher guns on a T8. The AA is just a nice bonus. I am an instinctual player, HE I aim for mid-line/superstructure, AP for deadcenter waterline for CLs. With the Cleveland I can never seem to cit her there consistently, so I start thinking (big mistake!) and moving my aim about to find that cit which can cause me to lose a desperate fight like that. Without IFHE I would have tried AP, but with it I can just about guarantee 2000-2500 damage a salvo with no chance for overpen/bounces which can happen against CLs if you hit too much superstructure. IFHE gives you consistent damage, so I find myself switching to AP less in this Kidd build. As far as selfish goes, I don't see this build like that. 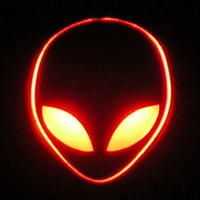 1., this is an individuals game in a team setting. 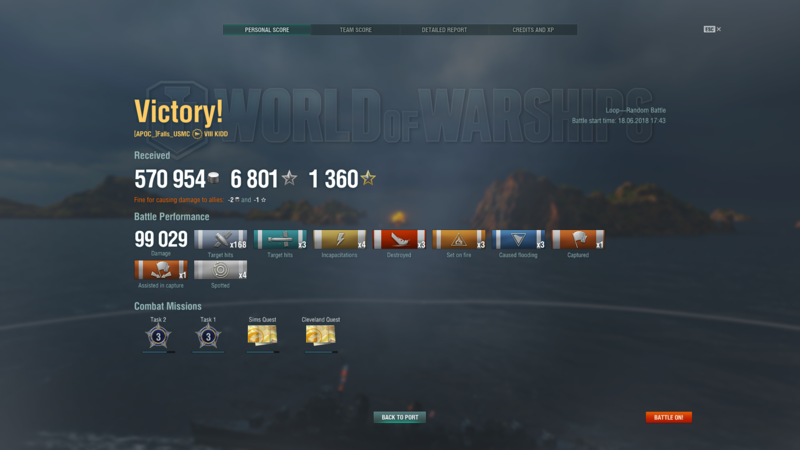 2, if you are playing solo, MM knows you are full AA and will only give you 2-3 CV games out of 10 (when CVs are in que) so you are hamstringing yourself when CVs are not in your match. You can help your team more by running the "selfish" build IMO. Also I think this build works well for a number of US DDs (Fletcher especially IMO) so the Capt doesn't have to be just for the Kidd. As far as AA, you are right that the Kidd is better mid-range but not enough to make that much of a difference over the Benson (considering the extra torp mount) or the Fletcher with the added bonus most CV players won't expect it lol. My record for the Kidd is 34, while the Fletcher is 42. It is even harder (solo) to get a CV match in the Fletcher than the Kidd so I don't do it often. Ah, I had completely forgotten you ran IFHE. That makes way more sense. I'd take the consistent damage as well. I'm gonna give your build a shot, I think. I've been running AA for 80+ games; bout time to switch it up. 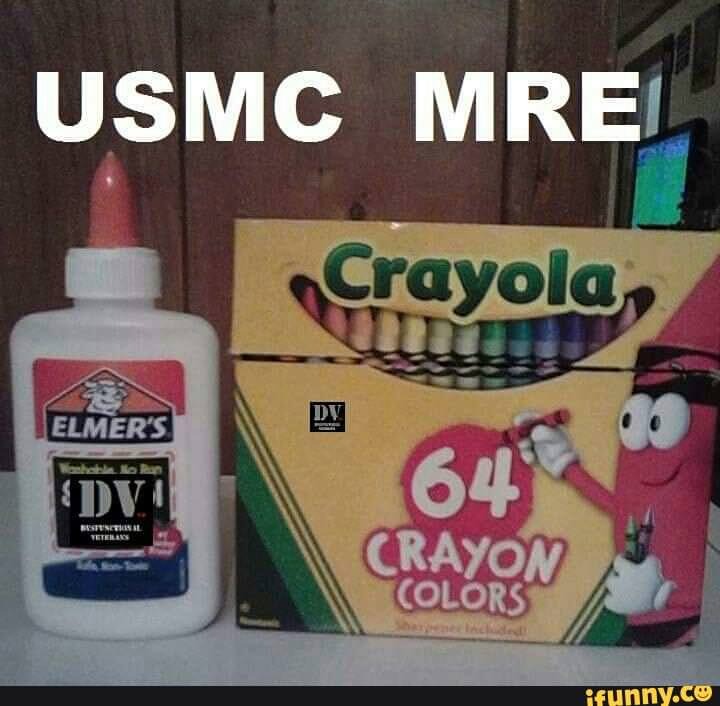 And hey, crayons are delicious. But only Crayola, none of that off brand nonsense. Try it I think you'll be happy, you'll have to post here after 10-15 battles and tell me what you think. I'm sad pants on this ship these days. She's a great boat for support, for killing other DDs, and for capping. But her low damage output means she can't carry when teammates die all around her. And I've play far too many losing games where I top the scoreboard with this ship. Starting off with a nearly 80% WR and that's since plunged to a measly 44% :( Awkwardly, my average XP on this ship is still pretty high. Basically, I'm getting better in her over time while my teammates are getting worse. My last game in her? On Trap. Capped A. Then capped B. Then went back to A, killed a Charles Martel, recapped A. Went to cap B, killed two DDs and then finally died ... as I was the last bloody ship left alive on my team trying to fight off seven reds. Feel your pain, brother. My last game was 80k+ damage, multiple caps, tons of spotting, and my team just had a complete meltdown and went from 7v5 to 1(me)v4 in a few minutes flat. Barf. Here are some examples of my Kidd gameplay, I would be happy to answer questions if you give me a time stamp. There are many ways to play this game and I do not claim to be an expert, but with all the "DDs are unplayable" threads out there I would like to show that it is possible to play DDs and still do well (in the Kidd at least, I love this ship). I dont record many games so I did not screenshot the exit screens but all of one of these are over 2000 base xp and 1st or second high score. hate the sleeping giant map!!!! @DeadMeat_015 Thanks for sharing your games, man. Excellent stuff. Two overriding trends I noticed (nothing to do with you.) is that it shows that the Kidd really excels when it's top tier and it does. It as absolute beast when it's top tier, especially against the T7 and 6 DDs. It's barely even fair. It definitely struggles against T10 spreads with the abundance of radar and the excellence of T9 & 10 DDs. I did enjoy your more offensive use of torps though. Very different of my own style of using them as purely defensive tools; but it served you very well. I have switched up my build and am only 5 games into it (work is crazy) but when I get to 12-15 I'm gonna post some results. It's a little different from yours, but it's an interesting switch. After that I'll try yours exactly, because it's definitely intriguing, and see how that goes as well. As far as torps go, I probably shoot them too much. There are time I wish I hadn't, but I find they are a great way to keep ships from maneuvering in ways you dont want them too or closing a high traffic slot you dont want someone using during an engagement while you are focused on others. Plus it has the added bonus of making them show their broadsides to your teammates even when they miss. Excellent write-up - exactly what I was looking for. I received the Kidd mission in one of the Freedom containers, I purchased - bought 5 and received the only ship I didn't have/was interested in. Lucky me! I'm about half-way through the mission - and am very much looking forward to Kidd in my port - it looks like a fun boat, and especially so for those odd sessions when CV population in the queue is high. Thanks again @Falls_USMC - Bravo Zulu. @ddoubletapp1 Thank you! and Congrats! You'll enjoy it if you like USN DD play. Particularly knife fighting. @DeadMeat_015 and everyone else, I'm up to 100 games total and 14 since making the switch to a non-AA build, so I figured that'd be a good time to post the results. This is the build I ran for the 14 games after switching. Cliff's Notes are inside the spoiler. The biggest changes from my original build were IFHE and Survivability, both of which made some big differences. Particularly the extra HP which most definitely kept me in games longer on multiple occasions. #1 - T10 MM. Defeat. 7k dmg, Khab sunk, 13 planes down. GZ shadowed whole time. 9k BB AP blapped. Kronstadt radar. 580k pot. dmg. #2 - T10 MM. Defeat. 84k dmg. Cap control center very well. Team has aneurysm and self-destructs. Smoke torp mino. 30k spot dmg. 1.2m pot. dmg. #3 - t8 MM. Victory. 38k dmg. caps and harassment. no opp to engage DDs or smoke shoot. #4 - T10 MM. Victory. 88k dmg. On flank against enemy Missouri and DMs and little support. 2 kills. Richlieu flooding kill. Radar killed by DM. #5 - T10 MM. Victory. 53k Dmg. Super potato enemy team. Over in 8 mins. Fire and torp dmg to Tirp and Yammy. One DD nearly killed. #6 - T10 MM Defeat. 35k dmg. super potato team. 3 kills. alone on a flank vs 3 dds and radar. hopeless. #7 - T10 MM Victory. 50k dmg. Good team. 3 kills. Spotted, harassed DDs, hit torps and capped. great game. #8 - T8 MM Defeat. 20k dmg. WORST TEAM EVER. Flawless defeat. No chance to do anything. #9 - T9 MM Victory. 40k dmg. 1 kill. Good team. Mostly dinking against BBs and one Benson. #10 - T8 MM Defeat. 47k dmg. 3 kills on 3 DDs. Smoked, capped, 17 planes down. 4th DD almost killed. Potato team is potato. Blapped for 5k by BB AP, of course. #11 - T10 MM Defeat. 60.7k dmg. Super campy idiot friendly team. OP Black on red team smoke/radar almost killed me. 1 kill on Akizuki. #12 - T10 MM Victory. 21.2k dmg. Moron red team. 2 caps. Barely got to shoot. Game ended before multiple torp hits on yammy. #13 - T10 MM Defeat. 45.6k dmg. Bad teams on both sides, mine was worse. Lost on points. 1 kill smoke shooting St. Louis to death. #14 - T10 MM Defeat. 64.2k dmg. 1 kill. torp and smoke shot Monty down. IDIOT team. Vigilance would have saved me from Yugo torp. This experiment did not start well. Of COURSE the first game I play has a savvy CV driver who completely ruined it. My original build would have absolutely ate him up and my abysmal stats would look much, much different. This did not bode well. However, it got a little better from there. Of the 14 games I think 4 had CVs, but two of those avoided me completely and were a non-issue. The poor independence in game 10 did not enjoy trying to sink me. Even with just Defensive Fire he got chewed up. However, with the AA build that 17 planes easily would have become 25. A few planes got away every time. So, comparatively my averages stayed roughly the same as when I ran my AA build. This honestly surprised me. However, there were definitely games where IFHE made a massive difference and more than likely saved me, and also padded my damage numbers in hopeless games where I was just trying to do whatever I could while my team lost their mind. Overall this was fun! I think it goes to show that the Kidd is strong no matter how you build her out. I did very much miss the independence that an AA build gives you. Manual AA means you can blap scout planes without using DFAA, and in CV games, you're not afraid to get out on the flanks because anything except a Midway/Hak is gonna get chewed up coming after you. It will be a real decision to decide what my build moving forward will be, but I'm leaning towards going back to an AA build. I have something of a fascination with WWII AA weapons, and while I don't get to use it too often, this experiment showed me that I'm not missing out on consistent 60k damage games by not have IFHE/DE/SE etc. But we'll see what I end up doing. It will be tough to give up the extra HP from SE. I may try to make a build that lets me keep that. But that being said, I'm gonna stick with the IFHE for a bit longer and see how it goes. It definitely is nice getting consistent pen damage on non-DDs and those Stalinium RU DDs. 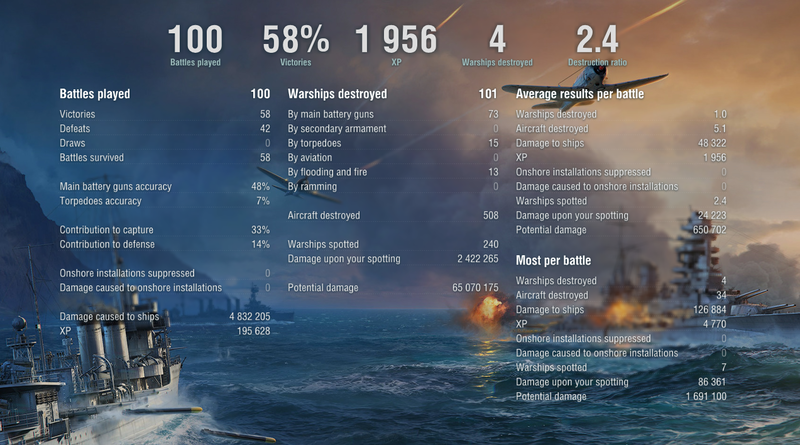 And for grins, here's my 100 game in-game page from the Summary section of the profile, and from WOWS Stats and Numbers. Ask any questions you may have about my choice in build or anything else! See you out there, fellow Pirates. @Falls_USMC I think with your gunnery skills (48% with US 5in! Hacker j/k) IFHE will up your AVG when MM starts being kind again. I know that many factors can determine how well I do in a match besides MM (time of day, tired not tired, indica vs sativa, music/tv choices etc etc) by I swear MM has changed for the Kidd. Your results confirm my (most likely untrue) bias. I played at least 50 battles in the week or so after 7.5 dropped at over 65% w/r, took some time off and I believe the next 15 I played were after 7.5.1 dropped (again confirming my unconfirmed bias). Also I thought that Defensive AA Fire Modification 1 was for T9-10 like the radar one, I may have to go back to an AA build myself for awhile. Especially if I am going to get such terrible MM, it maybe time to go more passive anyway, which I tend to be when running AA. I will give your AA build from page 1 ago I think because the worst thing I hate about running my AA build is the 15.5k range on the guns. Plus having the extra smoke and DF is a plus, but losing the 7.2k range is a pretty big negative IMO, because if you wait till they spot you it takes them forever to get out of your umbrella. I will miss running the engine boost tho (with the special upgrade module), as it really does make the boat a joy to drive while its running. Also, what is your secret for your gunnery skills? I swear MM has changed for the Kidd. I am also seeing comments in chat "the Kidd is cancer"
I haven't seen the negativity in chat, that's interesting. 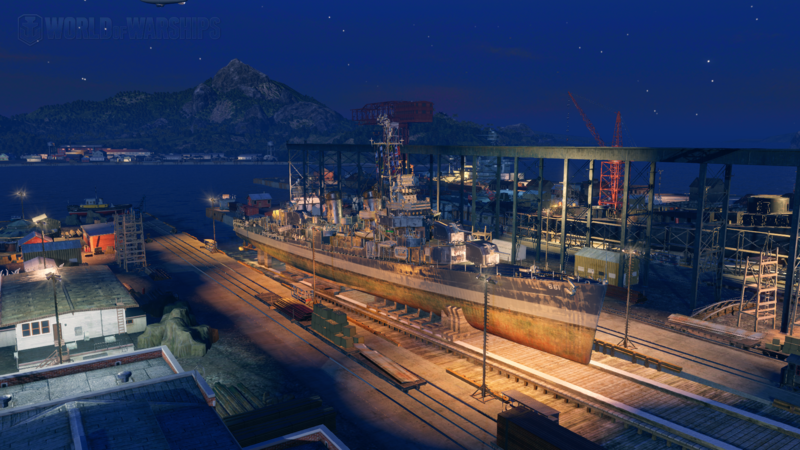 The Kidd is the last ship I would think WG would have an issue with from the playerbase, seeing as not many people have it, and its a very tough ship to play well in. High skill floor, if you will. Although maybe that's why? Inexperienced players just YOLOing in? But that's no different than half the standard DDs I see either. I dunno. And yeah the MM the last week or so has been particularly brutal. It's probably recency bias, as I can recall other times, like right after the Bismarck came out and it was all I played for a couple months, where it seemed like it was constant T10 MM. 14 games is a pretty small sample size, so I'm not quite ready to put on the tin foil hat. T8 MM has sucked for a long time. And as for gunnery? I dunno, man. Those 5in rifles just speak to me, I guess. It helps that I have 1,000+ games in ships that use the same guns (Fletch, Gearing, etc.) So I just get used to them. I just take high percentage shots, really. Lots of it is on DDs, sure, but on the cruiser and BB volleys, I just only shoot when I can guarantee hits. With the death of stealth firing, and how badly everyone wants to kill DDs, I don't pull the trigger unless I know it will produce damage. I rarely fire on anything past 9km unless I absolutely have to (to delay a base cap for example), and unless I'm trying to light multiple perma-fires by targeting the bow and stern, I'm always aiming at the juicy part of the ship. 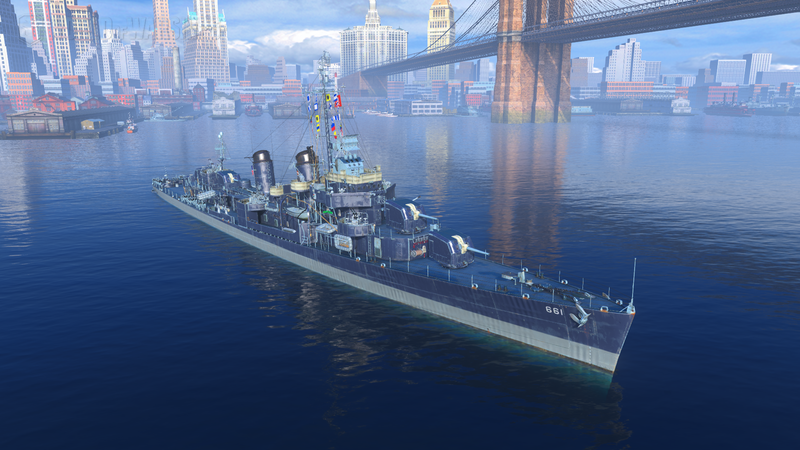 Read your original write up on page one as I just got the Kidd and will probably dedicate a captain to her. I understand your point about not taking AFT as hitting ships with those looper shells isn't worth the effort and the detection you give up..also, with that 7.2k AA do you find that you end up exposing yourself to much in an effort to use your aa.... rather than having it at 6k and staying undetected longer? Another question is do you feel manual AA is worth it? 4 points? lets say you get a cv 20% of the games... Is it worth 4 points.. defensive fire is enough to bring down spotter planes quickly isn't it? It's a bit of a double edged sword to be sure. I did miss the 7.2km range absolutely, but my reasoning was that the raw alpha of MAA makes up for the loss of range, since you do more damage in that shorter period of time. If you pop your Defensive fire right when you're detected at 3-ish km, you're gonna do far more damage in that shorter amount of time as the planes try to get out of your range, than you would in that extra 1.2km without the boost of MAA. It just requires a bit more micro-managing on your part to switch targets as squadrons evaporate. The other reason I like MAA is gives you a much needed boost when your defensive fire is on cooldown. It lets you swat spotter planes quickly without needing to use DF, and lets you keep that for when real strikes are coming in. This is from LittleWhiteMouse's most excellent review on the Kidd. You see with MAA and BFT and Defensive fire, you're essentially a North Carolina for 30 seconds. And without DF, the manual AA boost is pretty significant. You don't have good AA, you are still a DD after all. But it certainly helps. ya, I guess if you are going to build an AA boat, build an AA boat. Took me a bit to figure out that chart but the 3 skill combo is eye popping. I saw on a previous post you are running IFHE now? Or have been toying with it? Thanks again! Yeah, I've been running IFHE for the last 16 games. It definitely makes you more effective against cruisers and BBs, as well as some of the armored Russian DDs. Not sure if it'll be my permanent build moving forward, but it's fun. whelp here goes! game number 1! the heal is incredible, I totally failed at manual AA and defensive fire, popped to late or to early its hard to focus on that while in a knifefight. Missed every torp by a mile. 17 hits on Hipper superstructure with IFHE for just under 5k damage. not sure how to read that. All in all it was a very fun game, I should have had 15 more planes kills, pissed I wasted that opportunity.. oh well a win is a win. Will continue tweaking...fun bote! @DeadMeat_015 @SweetsieI uploaded a couple games. Neither of which are particularly good, but both highlight certain things I've been saying. Northern Lights: This game was awful in almost every way. Poorly positioned team, no caps to contest, annoying campy Cleveland and no planes to shoot down. The only thing of note is at 7:40 when I fire my torps offensively, when I've always been a staunch advocate of saving them for desperate defensive moments. Neighbors: This was a weird game. No caps. And no real DD threat and not much radar. So I essentially tried to delay the flank while my team went for the cap (and ran for the borders.) Good example of just how much of a difference IFHE can make when you're shoehorned into shooting at BBs and Cruisers. Edit: and of COURSE as soon as I forget to record a game. I have this one. Good grief. So, I made the decision to go back to my original build after my IFHE experiment, and immediately out of the gate I had the two best games I've had, hands down, since before I tried a different build. Not sure what it is, maybe luck, maybe placebo, maybe a bit of both, but I think knowing that I had IFHE made me play differently, to my detriment. Anyway, I'm back to the AA build, and will continue on with it. If I ever feel like switching it up, I have an IFHE Cleveland Captain ready to go. Also, I unlocked the alternate DD camos through the Halsey Campaign and the Kidd looks....SWEET. travel during the week, so I don't log on to the forums... with your return to the AA build are you playing solo or div with a CV? My very few games left me feeling that I needed to go with a tankier/less AA build as almost all of my play is solo, although the CV action appears to be picking up. with your return to the AA build are you playing solo or div with a CV? My very few games left me feeling that I needed to go with a tankier/less AA build as almost all of my play is solo, although the CV action appears to be picking up. 99% solo. I run into CVs in I'd say 25% of games. For stretches sometimes more or less. I do miss having the extra HP from SE, but other than that, having Superintendent and BFT, those help in every game. I guess it just comes down to me having a fanatical hatred of skycancer and not having to worry about planes in CV matches, and being able to blap scout planes without burning DF is a huge upside for me, and is worth the sacrifice of those skill points into Manual AA. Unless you are divisioning with a CV, a AA-build seems objectively a poor choice. Last time I checked WoWs stats it was about 1 in 3 for a CV. Dedicating 4 points to MAA in particular seems silly; a skill useful 1 in 3 games? That's not playing the odds very well. Picking them over something like SE which is useful EVERY game (and increasing your survival 10% also increases you gun hits and torpedo hits and caps by 10% if you view it that way) seems silly. DE (not a skill I personally pick often) is also useful EVERY game. IFHE is also objectively not very useful at T8+. The extra pen is useful only against T8 cruiser extremities and T6-7 BBs, with reduced fire penalty. Given most Kidd games are T8+, that's only one class it's useful for. A high price for 4pts. Again, the odds of it being useful are not high. If you have 4pts to burn, RDF can be used every game. Even Vigilance would be useful more often. Lets say MAA is useful one game in three. Well, if I look at my survival rate in Kidd it's at 57%, so SE might have been useful in 43% of games, and that's assuming that the situation I was in was survivable at all, or the last hit wouldn't have taken off the amount of HP that SE gives me, so lets say 40%. Ten percent increase? Sure, that's viable. But that's not 'every game useful' territory. It depends on the game. DE you could absolutely make the case for useful every game, since you always shoot at ships, and doing damage and making people burn DCP's is tremendously valuable. 100% agree it may be a better choice. Vigilance? Sure. Now do I remember every occasion where a torp killed me? No. But I'm willing to bet that of those few times I did die from a torp, even fewer of those would Vigilance have saved me. Maybe, maybe not. Either way, its not an 'every game useful' skill. AFT, as you pointed out, is suspect. I don't like the extra gun bloom and the concealment loss doesn't make up for the extra gun range, though the extra AA range is a huge bonus. IFHE I agree. There's a reason I specced out of it after trying it out. I don't necessarily 'play the odds' when choosing Captain's skills. I think it's just a matter of deciding where you refuse to be weak. Rather than getting wrapped up in percentages. And honestly, the Kidd is a strong ship with a 10 pt. Commander, it's strong with 13. It's viable just how it is. The remaining points for me is all about picking your specialization. Do you always get to use MAA? If you include scout planes I bet I use at least half of my games. And in games where there are CVs? I don't have to play any differently than I normally do. Because planes are a non-issue. And I'm still strong at everything else I want to do simply by the nature of the ship and having BFT and SI. Beyond that, in almost every CV game I'm in, I have the opportunity to wipe strikes that would otherwise hurt my team. That can make for huge swings in your favor. But to each their own. Maybe I just like to be silly.